Lipscombe, Nick. 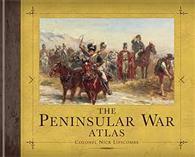 The Peninsular War Atlas. Oxford, UK: Osprey Publishing, 2010. 384 pages. Slipcased. ISBN# 9781849083645. Hardcover. $75. Robertson, Ian. An Atlas of the Peninsular War, 1808-1814. New Haven, CT: Yale University Press, 2010. 144 pages. ISBN# 9780300148695. Hardcover. $55. Two atlases of the Peninsular War have been published during 2010 and this review compares the two. The Peninsular War Atlas by Colonel Nick Lipscombe, hereafter referred to as the Lipscombe Atlas, is an impressive size (and weight) with a slip-in cover. It comprises 384 pages and contains 161 maps in a format of alternating text (on the left page) and maps (on the right page). There are also 27 pages of introduction and 34 pages of appendices, glossary and bibliography. The maps are universally 10 ¼ inches x 7 ½ inches (26 cm x 10 cm). Nick Lipscombe is the Chairman of Peninsular War 200, which is commemorating the events of 200 years ago and the Atlas has been published in collaboration with that organisation. The Atlas contains a foreword by the current Duke of Wellington and acknowledgements to a great many distinguished military historians, including several contributors to the Napoleon Series. The preface to the Lipscombe Atlas outlines the history of military mapping of the Peninsula and states that the aim was to produce a set of maps in a common style in which precedence is given to military detail, whilst topographical detail is kept to a minimum. Most of the maps are universally pale green for land, grey for buildings and pale blue for rivers or sea. Contours and woods are shown but there is no other colouration of the topography. NATO standard symbols (i.e., for infantry) have been used for all military units and there is a legend to make these clear to those who are not familiar with them. There are five exceptions to this general style of presentation, where an angled panoramic relief view is shown and the troops are depicted as coloured blocks. The introduction also makes it clear that the atlas covers all of operations of not only the Anglo-Portuguese army but also those of the various Spanish armies in what was very much a coalition war. The Lipscombe Atlas succeeds in providing a very comprehensive set of maps and explanatory text for all of the war in Spain and Portugal, including many actions between the Spanish and French hardly mentioned at all by some English-speaking historians. The major battles have more than one map to show the sequence of events. I personally think that the maps would have been clearer if there had been a gradation of colours from green to brown to show hills, rather than just relying on contour lines. I also think that the reliance on NATO standard symbols alone was a mistake. Such a system is fine for strategic movements of armies and can even work at the operational level of Corps and Divisions. It is far less satisfactory at the tactical level of Brigades and Battalions, which would be much clearer if represented by coloured blocks of an appropriate frontage for the scale of the map. Interestingly three of the five angled panoramic relief views (Medina de Rióseco, La Coruña and Talavera) use coloured blocks to represent troops, one of the Salamanca shows a mixture of both systems whilst one of Vitoria shows NATO standard symbols on the panoramic relief. There is finally one conventional map of Salamanca which uses a combination of both systems, showing individual battalions as coloured blocks, and the area occupied by each battalion and brigade is much clearer than the equivalent maps of many other battles where battalions and brigades are standard NATO symbols. Clarity is not helped by the choice of colours for these NATO standard symbols. British are shown in red and Portuguese in green, both of which are fine, but Spanish are shown in black and French in a dark blue (which is virtually purple), so it is very difficult to distinguish between Spanish and French troops on the maps. The text accompanying the maps is very detailed and seems to me to be consistent with other sources. I looked particularly at that for Albuera and was surprised to see an insert showing Girard’s formation as “Ordre Mixte”, particularly since Guy Dempsey’s “Albuera 1811”, which disproves this formation, is quoted as a source in the bibliography. The atlas has some very useful appendices showing Strengths and Dispositions of the contending armies at various dates. Much of the British, Portuguese and French is standard stuff as in the similar tables in Oman but the Spanish Orders of Battle are largely derived from Spanish sources and are much more detailed (ie down to battalion level) than others I have previously seen. The official price of the Lipscombe Atlas is £45 but I bought mine (brand new) from Amazon for £26.29. I note that Amazon USA shows it as $75 reduced to $47.25. 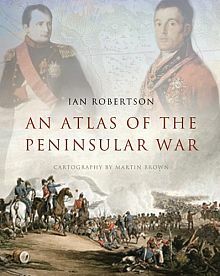 Ian Robertson’s An Atlas of the Peninsular War, thereafter referred to as the Robertson Atlas is a slimmer and generally smaller book than the Lipscombe Atlas. It comprises 144 pages and contains 53 maps. Most of the maps occupy a single page, normally the right hand one, with a map size of 7 ¾ inches x 6 ½ inches (19.5 cm x 16 cm) but there are a few maps which span a double page and several smaller ones to show various aspects of the particular campaign or battle. In his preface Ian Robertson states that he lives in Southern France with his Basque wife and has spent fifty years studying the Peninsular War. His acknowledgements include many of the same experts as the Lipscombe Atlas, again including several contributors to the Napoleon Series. In his introduction he also covers the history of military mapping of the Peninsula. What some may find less satisfactory is that he makes it clear that his view of the Peninsular War is entirely from an Anglo-centric point of view and the actions of the Spanish are only covered when they were co-operating in a joint action with a British or Anglo-Portuguese army. The maps themselves were drawn by Martin Brown and have more colour in them than those in the Lipscombe Atlas, using a standard cartography system of increasingly darker shades of brown to represent higher ground. The troops are shown as coloured blocks, in line, column or square, using red for British, brown for Portuguese, yellow (probably more orange) for Spanish and blue for French. This is also much clearer than in the Lipscombe Atlas. I found both the maps and the symbols used in the Robertson Atlas to be excellent. The text descriptions of the various battles seemed to me to be consistent with other accounts I have read, although I cannot pretend to be an expert on every battle in the war, and there is much controversy to this day over many aspects. I looked particularly at that for Salamanca where the text is far less detailed than that in the Lipscombe Atlas but Robertson’s main map and five sub-maps were far clearer than in the Lipscombe Atlas. The official price of the Robertson Atlas is £25 but I bought mine (brand new) from Amazon for £23.75, not such a massive reduction as the Lipscombe one. I note that Amazon USA shows it as $55 reduced to $38.68. I did note that there were differences in the detail of the maps in the two atlases, particularly regarding minor tracks and roads. I tried to compare those at Albuera and Salamanca with other sources and got even more variations, so I have absolutely no idea which is correct. In conclusion, it depends what you want. The Lipscombe Atlas covers all the battles of the Peninsular War, as opposed to the Robertson Atlas which covers just those involving British forces. The Lipscombe Atlas also has much more detailed text and very useful appendices. In my opinion the maps in the Robertson Atlas are superior to those in the Lipscombe Atlas. If you are happy to have maps covering only battles involving British forces then I would recommend the Robertson Atlas for the quality of the maps (assuming you can use Oman for the text). If you want to cover Franco-Spanish battles as well, then you need the Lipscombe Atlas. Personally I am happy that I have both.